Medicine is like a religion. Some follow it strictly, some don't. Some just using it for money. 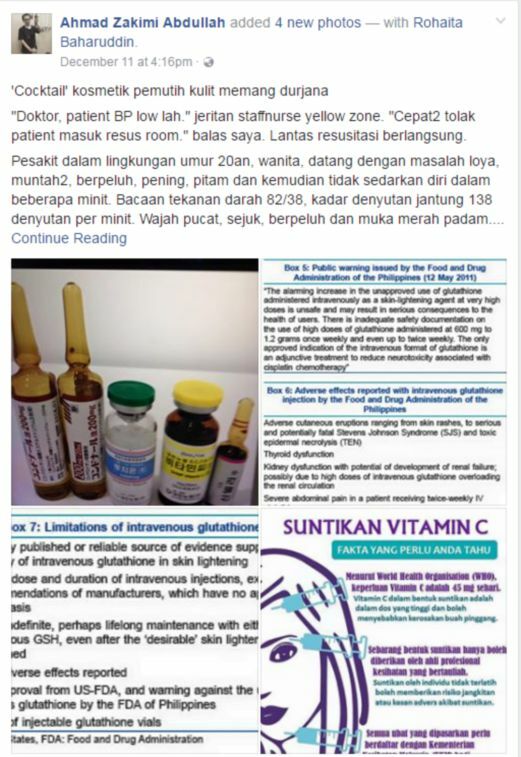 Just about two weeks ago, my wife asked me whether this trending therapy using gluthatione, a therapy to make your skin whiter. I have to say that I am still practicing medicine in a real way. It's not my expertise but I am not pretty sure what Gluthathione is good for? My encounter with this Gluthathione thing was when I read my text book on liver disease. Well those who lack of this enzyme will be more prone to get liver toxicity due to paracetamol poisoning. Something like that. And obviously if you read on physiology an biochemistry, you will encounter with this thing. It's a essential substances in our body. Ammonium is also essential in our cell metabolism but do we drink ammonium for health reason? That would be crazy. A lot of substances in our body are actually toxic but due to their micro amount, we manage to utilized them perfectly. Nature was a beauty. 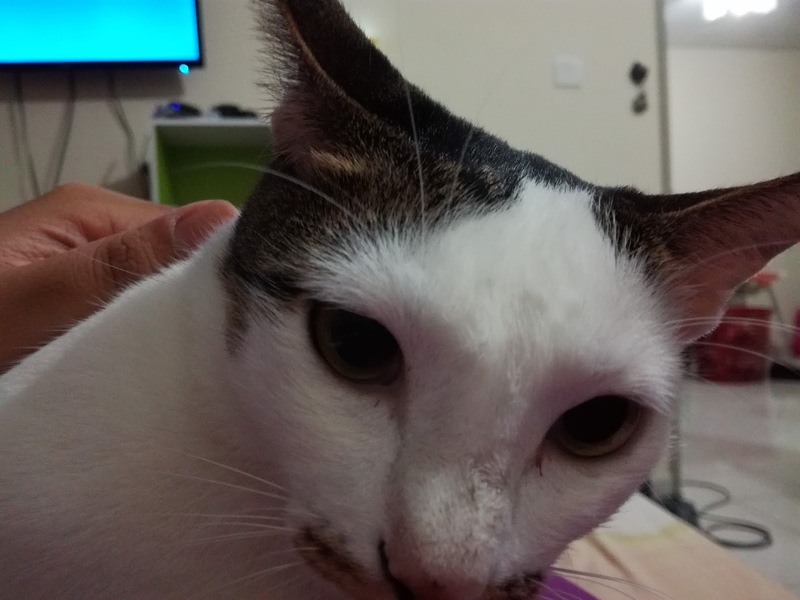 This cat apparently does not need any crap supplement to make her look cute. She eat a good food, she was taking vaccine to prevent infectious diseases, and that's it. She live a perfect healthy cute life. She never complain her fur was not whiter or something like that. Back to my wife question, I told her that it sound dangerous when someone start prescribing Gluthatione via IV for a reason like that. There are some condition that we can give that via IV but certainly not to a healthy person who want to turn white. It does not make any sense. Who would dare to do that? Apparently, there are people who dare to do that. All of them, were trained doctors. Some medication were created for other purposes. However, in medicine, you tend to use that medication for other purposed you think beneficial for your patient. One great example is metachlorpromide. This medication is used to prevent a patient from nausea and vomiting. However, knowing that this drugs also inhibit dopamine which inhibit prolactin - thus more prolactin will be there to increase lactation - we use this medication for mothers who have low breast milk supply, to help them to produce more milk for their babies. It was off label use. The manufacturer does not spesifically design the drugs for that purposes but we use them anyway. However, try looking for the evidence on that metachlorpromide. I bet you, you will find a lot of journal out there showing that metachlorpromide and domperidone are actually safe and useful for that purposes. (Please search in sciencedirect.com, or some sort of Google Scholar article instead of just google. Cause google now are paid to show their result, so if you are looking for a thief, don't ask another thief to tell you). Evidence based medicine. The real 'religion' for doctors. For something to be called real, you need a text to support you. Same like religion, Islam have Quran, Christian got Bible, Jews have Torah, and so on. For medicine, Those credible journals are our text to support us. There are a lot of journal which was written by company or person who love to ruined our 'holy religion', so beware. As they were atheiest, they were also aesthetic. When I woke up this morning, I read an article in the news and a facebook post by a doctor who finally have the courage to share his experience in battling one on one with the side effect of the skin whitening therapy. I am not surprised because I have been talking about this so many times in my blog post. I have lost track on how many time I have written on such un-medicine therapy. Sometimes I get tired on writing on that subject, because apparently, those who created this mistake, was our own comrade in medicine. As I have mention before, we are breeding monster everyday in medicine. From 100 medical graduates, 20 will be practicing real medicine, the rest will not. And from the rest who do not, more than 50% of them will become a monster. I just wish that all the fallen comrades, from whatever they are doing, please think about our oath when they give us the licence. Do No Harm. A simple oath by our Father of Medicine which bring a real meaning to what we are practicing.